As the sun dropped below the western horizon one evening in December 2014, we watched the parting glow from the cockpit of Archer, our Outremer 51 catamaran. We were anchored in Bequia’s Admiralty Bay, our first island stop after completing the ARC+ rally from Gran Canaria to St. Lucia via the Cape Verde islands. When darkness fell, we watched the masthead lights of the monohulls anchored nearby whip metronomically back and forth in the harbor swell. Unaffected by the motion of the sea, Archer sat quietly. 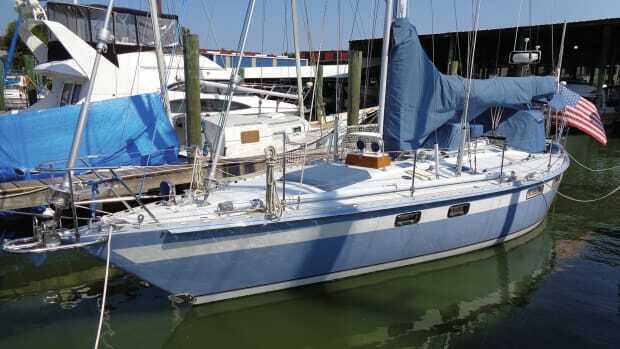 Four months earlier, after more than three decades of sailing monohulls across oceans, to the Caribbean, and up and down the East Coast of the United States, we had begun our transition to a catamaran. We were looking for a change—and a challenge.  We thought we might be able to cruise farther into the future on a cat, and we wanted to be able to invite our grandsons and their parents to visit us comfortably in the added space of a multihull. 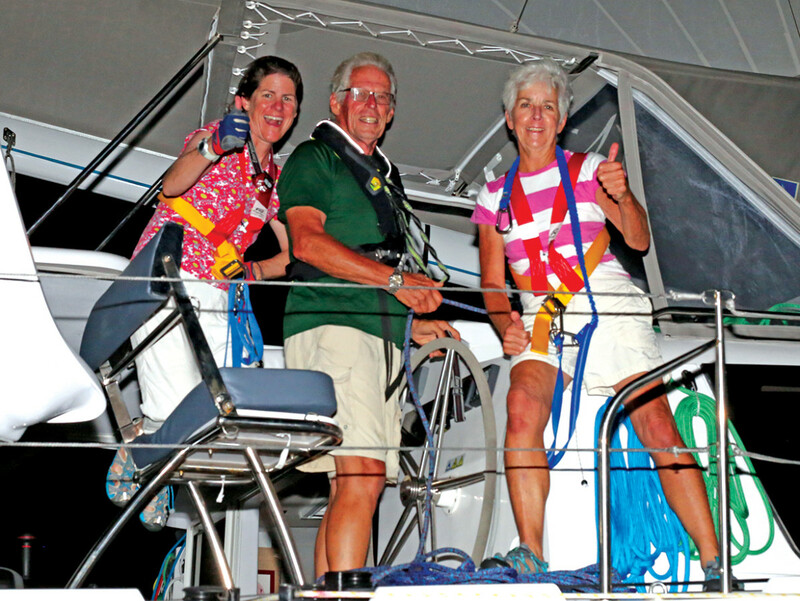 Sailing and living aboard a cat is, in some ways, very similar to cruising on a monohull. 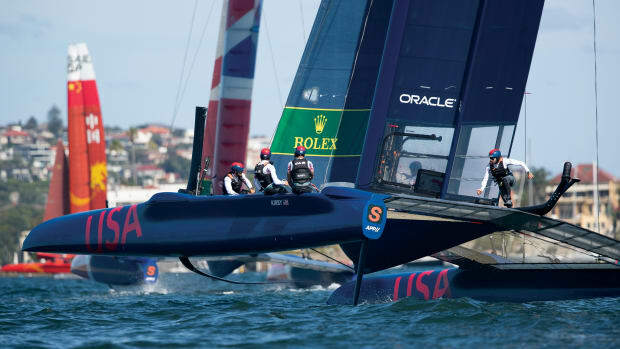 After all, sailing is sailing, and the same principles apply to both types of boats. But all boats are different, as we have experienced when we changed monohulls in the past. Speed has always been important to us. It’s not that we are racers, but the boat that goes faster gets into port sooner. The boat that gets into port sooner avoids the next squall or approaching front. 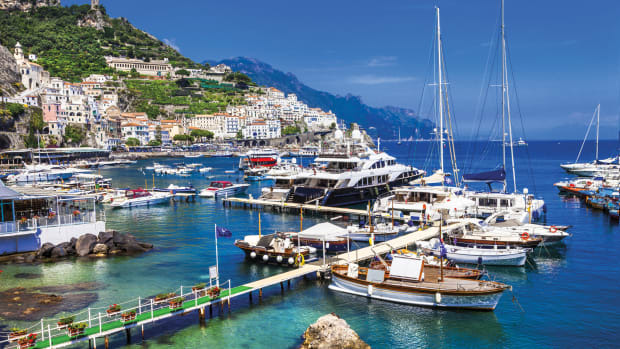 And cruisers on faster boats have more time to explore their destinations than those who spend more time at sea. On our last monohull, a Saga 48 named Altair, we consistently arrived in port among the top 10 to 15 percent of the boats we sailed with. We met that same expectation with Archer in the 2014 ARC+ rally. To be clear, Archer is a cruising catamaran, designed by Outremer Yachting to combine performance-enhancing characteristics like daggerboards with comfortable accommodations designed for a cruising couple and their guests. We are not flying hulls and defying gravity when we sail, and we certainly are not suffering with pipe berths and compromised living spaces. Sailing well in all conditions and at all wind angles is the key to consistent speed on a long passage on a catamaran, just as it is on a monohull. In downwind conditions, we have wing-on-wing options and use a symmetrical spinnaker on Archer, just as we did on Altair. For heavy air, we have a staysail and a mainsail with three reefs. Just as on Altair, the reefing lines are led back to the cockpit. On Archer, as on Altair, some of the winches are electric, others are manual. We reef at about the same wind speeds on Archer as we did on Altair. And on both boats, it is often the case that reefing doesn’t slow the boat; it just makes it more comfortable. The difference is that a monohull tells you when to reef because you can feel the strain on the rigging and the excessive heel of the hull. On a catamaran, you reef at prescribed wind speeds as shown on the gauges, because the strain on the rig is less evident, and you are always sailing flat. Contributing to Archer’s performance is the integration of daggerboards into the hull. That’s something we had to learn to effectively sail our catamaran. Raising and lowering the boards adds a step to the tacking procedure, but it is easy enough to do with the electric winches. Lowering the boards, we found, also helps to stabilize the boat in swells or confused seas. On passages, we have always sailed as a couple or, on long trips, with a third crewmember. We generally operate a three-hour, single-person watch system at night. Sometimes when squalls are likely, we put in a single reef before dark and change from the reacher to the genoa. One person can easily furl the genoa. Rick sleeps in the saloon where he can be easily awakened by the helmsperson if need be. All these routines are exactly the same as those we practiced for years on our monohulls. 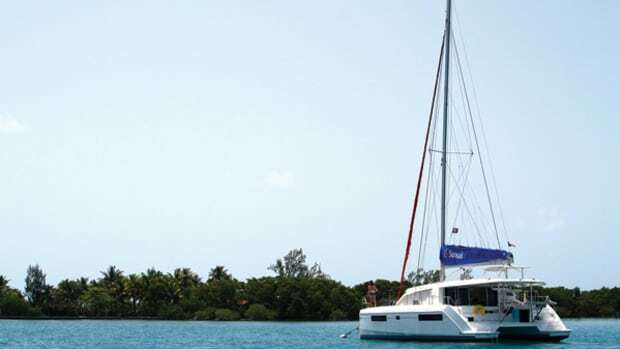 Our goal to operate as “green” as possible is the same on our multihull as it was on Altair. On both boats, we used solar panels and a Watt & Sea hydrogenerator to charge our batteries. Altair had greater energy needs, and was also equipped with a wind generator and a 7Kw diesel generator. When given an opportunity to design Archer as we wanted from the factory, we chose to simplify the electrical system and eliminate both the wind and the diesel generators. The motion on a cat is different from that of a monohull. Sometimes, it is noisier, too. Frequently the waves and swells hit one hull from one angle and the other hull from another. 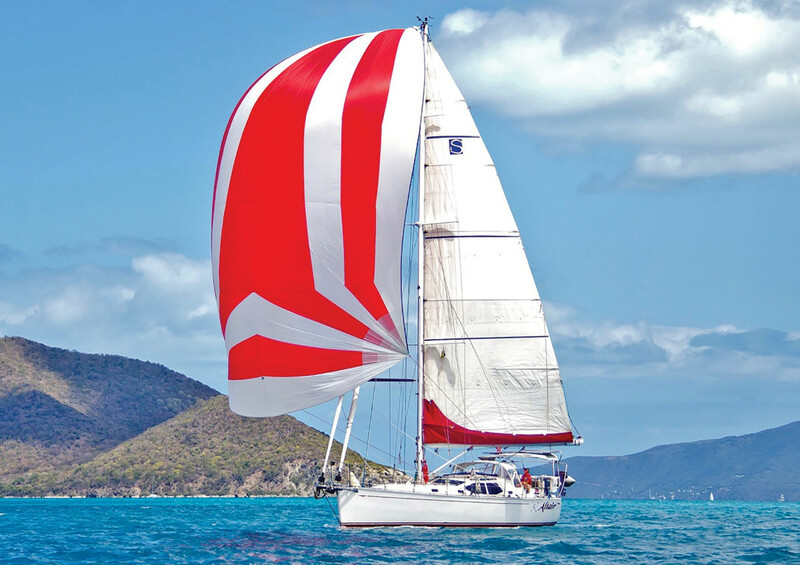 As our boat mate Tim Szabo explained, “Once one ‘gets it’ … the quicker, shorter motion … you realize it is a sailboat too, but one in which all the sea routines are easier and getting around is much more comfortable. 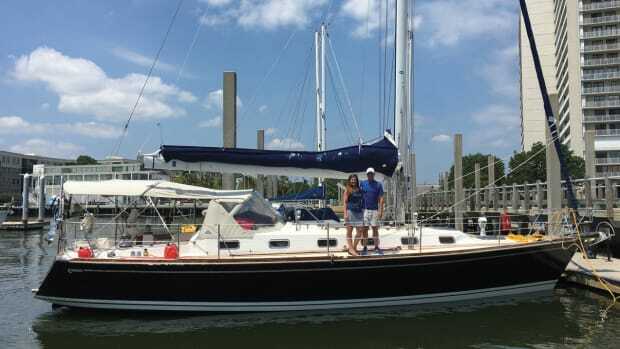 Lots of space to be alone, but together, too.” Before sailing on Archer, Tim completed an Atlantic Circle and many thousands of ocean miles on his Saga 43, Kinship. Sailing flat on a multihull is less physically demanding than sailing “on your ear” aboard a monohull. Getting in and out of bunks without lee cloths is effortless. We boil water on the non-gimbaled stove in the galley without fear of splashes and burns. More meals are prepared underway instead of being premade and frozen. Cranking a winch with both feet firmly planted on a flat deck is much more efficient than cranking when you’re off balance and the boat is heeled. The trampolines are a working platform that allow us to change sails or raise and lower the spinnaker easily and safely. In our monohull days, we were very comfortable sailing wing-on-wing, usually with the mainsail stowed, the genoa poled out to windward and the jib flying to leeward. On Archer, however, we do not have a pole—most catamaran sailors don’t use them—so we sail with our bright-red reacher to leeward and the main with a preventer on the boom to the other side. When we substitute the genoa for the reacher in higher wind conditions or in anticipation of squalls, we add a barber hauler to better control the height of the clews. The trick to flying a spinnaker without a pole, we discovered, is to apply tension to both guys, one on each hull, and trim the sheet to keep the chute full. Steering a cat is much more a matter of watching the gauges than with a monohull. We steer Archer with the autopilot, carefully tweaking degree by degree to aim the boat as far downwind as possible and keep the sails full. 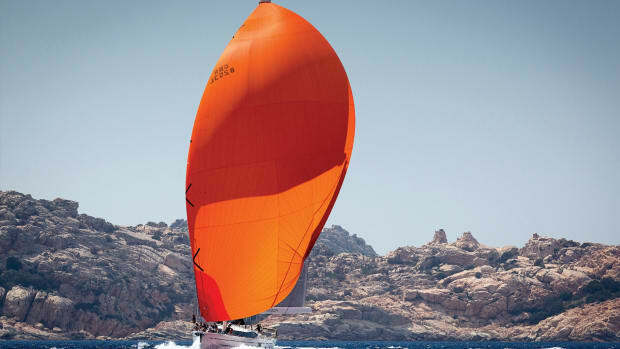 Alternatively, we use her tiller to steer with greater feeling for the motion of the boat and its reaction to the wind—a bit closer to the feel of a monohull. We can keep sailing comfortably in less than 10 knots of true wind. 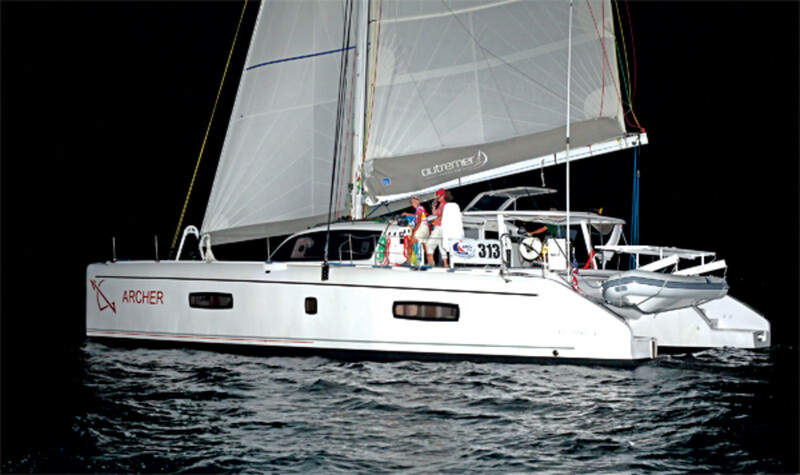 We ended the transatlantic run to St. Lucia with only about five motoring hours—many fewer, we believe, than we would have had on Altair with her 6ft keel and heavier displacement. Weight is a much bigger deal on a catamaran. 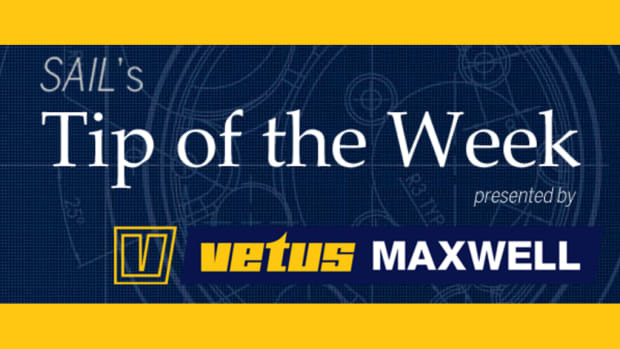 Excessive weight can compromise a multihull’s performance much faster and more dramatically than on a monohull. We outfitted Archer to be as simple as possible with 12-volt electricity, no generator, no washer/dryer, no ice maker and AC in the saloon only, which we only use when docked with shorepower. A year and many thousands of catamaran sailing miles later, we are happily still climbing our learning curve, discovering new ways to sail Archer more effectively each day. There are plusses and minuses, compromises and trade-offs, as with all boats. But in the end, the biggest difference is that we generally sail about 2 knots faster than we used to on Altair, more easily and also more comfortably. That’s hard to beat!